If water is threatening your home or business, you need to get help immediately. Water is everywhere – in our pipes, in the ground around our property, in our drains, flowing off the roof—and it is highly likely that your property will sustain damage from water at some point. Most claims of damage from water begin with a small leak. If left untreated, that small leak could turn into a big problem when it comes to your health and personal property. When you call Rumsey Construction and Restoration for your water damage needs, we will arrive immediately to start removing the water and drying the affected areas. Immediate action is required to minimize the amount of damage to your property. Our technicians used advanced technology, powerful tools, and industry-leading methods to make sure your property is being cleaned and repaired the right way and the best way. Let the experts at Rumsey Construction and Restoration handle your water problem, day or night. With our employees available 24/7, we are always ready to take care of your water repair needs. Contact us now! When water impacts your property, the first thing you need to do is get it out! At Rumsey Construction and Restoration, we'll respond quickly and fully prepared to handle the initial water extraction and to begin the drying process right away. Whether you have a few feet of water in your basement or just soaking wet carpet, we'll extract the water using high-powered extractors to get as much of the water out as quickly as possible. Then, once the bulk of the water has been removed, we will utilize fans and dehumidifiers to dry the affected area before additional damage can occur or mold growth can begin. We use the most advanced drying equipment and will continually monitor moisture levels in your property until it is dry. Our skilled water damage technicians will have your property back to normal in no time. When it comes to restoration, you don’t want to take any chances. Any area that sustains damage from water and is not completely dry within 72 hours is likely to grow mold. Mold can begin to grow within 24 to 48 hours and can colonize in under 12 days. The presence of mold can not only devalue your home and damage your property, but it can cause major health problems. While it may seem like a common cold, mold can be serious for individuals with weak immune systems or those who are already in poor health. 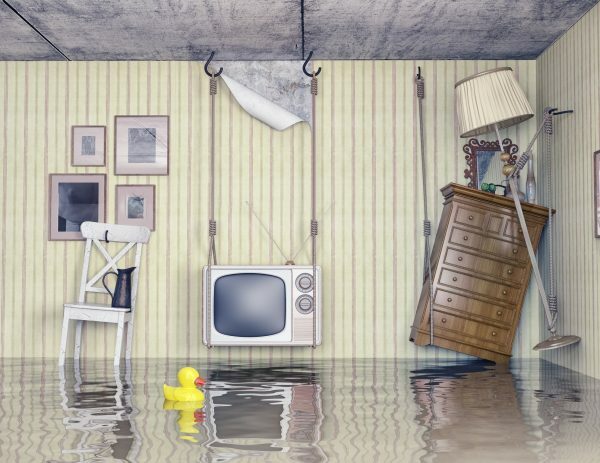 When water damage happens, it may seem like the end of the world, but it isn’t! Fortunately, something can be done. Rumsey Construction and Restoration has extensive experience with water damage restoration and mold removal – you’d be amazed at what we can do! The most important thing is to get help immediately as the longer the water sits, the more damage it will cause. We’re standing by for your call 24 hours a day! Rumsey Construction and Restoration has gained a reputation as the restoration experts in South Carolina. Here’s our formula for remediating damage from water in your home or business. 1. When you call Rumsey Construction and Restoration, we rush to the scene of the damage immediately no matter what the time of day or night. That way we can contain the damage as much as possible. 2. Once we arrive, the first step is to find the source of the water and make sure that no more water is leaking or seeping in. 3. Once we’ve stopped the flow, we extract out the water as quickly as possible using commercial grade extractors. We also clean away silt and sterilize grey or black water damaged areas (i.e. sewage). 4. We then begin drying the area immediately to prevent mold growth. We set up commercial fans and large dehumidifiers to dry the area as quickly as possible. 5. Once everything is dry we use thermal detectors to determine what needs to be restored and what is okay the way it is. Often dry wall and carpeting cannot be salvaged if it remained wet for too long. 6. After removing damaged items, we restore your home to its original condition – rebuilding walls and ceilings, restoring flooring, structural damage and repainting. Contact us to begin talking about your commercial construction project.